This was Primo's last film as an actor. The world famous wrestler retired after appearing in over 22 film / tv roles. It's probably his most recognizable as well. 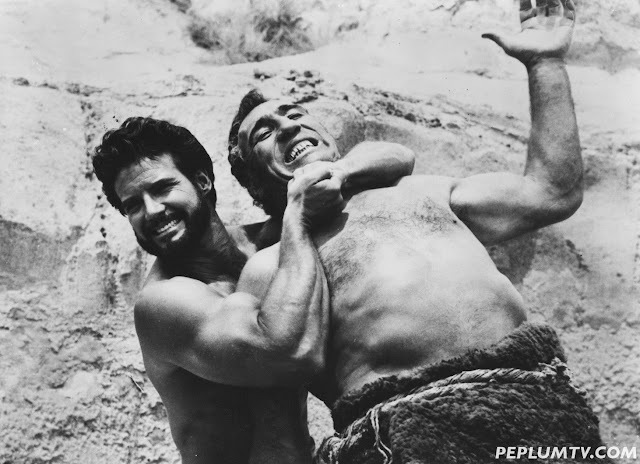 As for Steve, well, his career didn't last long (a solid ten years, with his biggest roles from 1954 to 1964) but he was at the height of his career with this sequel to HERCULES (1958). Steve was THE action star of the late 1950s and early 1960s. He was a good boxer and was really big, and it is awesome the strength of Steve as he bears Primo up the slope to throw him to the water. That scene is a real clash of titans. A really magic scene! I read a lot about Greek myths when I grew up, and the tales of Hercules were among my favorites. The fight with Antaeus is sort of a throwaway adventure, squeezed in between two of the more famous labors. But it sums up the world of the myths very well, with two offspring of deities squaring off in the world of humans. This scene captures that mythological atmosphere perfectly, and it all comes just from the enthusiastic performances of the two adverseries. Regrettably the critical part of this scene is missing from the relatively new widescreen English dub versions of HERC UNCHAINED now available. In these WS versions, the dialogue is cut in which young Ulysses, from the safety of the wagon, shouts to Herc that the antagonist must be Antaeus, the son of the Earth Mother. Instead the flattened Antaeus gets up, again takes on Herc, and Herc tosses him into the ocean. I can't figure out why they cut this, it's only a few seconds of film. But it's still intact in the earlier pan-and-scan versions. Brodie, that English copy is probably from the German DVD (it has the English audio). I have it and it's cut. I have the film in another English version and that scene is not cut. It is a weird cut.